SRDIC, S. , DESPOTOVIC, Z. This paper presents a buck-boost converter which is modified to utilize new 600 V gallium nitride (GaN) power semiconductor devices in an application requiring 1200 V devices. The presented buck-boost converter is used as a part of a dc/dc stage in an all-GaN photovoltaic (PV) inverter and it provides a negative voltage for the 3-level neutral-point-clamped (NPC) PWM inverter which is connected to the utility grid. Since in this application the transistor and the diode of the buck-boost converter need to block the sum of the PV string voltage (which is normally in the range from 150 to 350 V) and the dc bus voltage (which is in the order of 400 V), the 1200 V devices or series connection of 600 V devices need to be employed. Currently, 1200 V GaN power semiconductor devices are not commercially available. Therefore, the standard buck-boost converter is modified to enable the use of 600 V GaN devices in this particular application. Based on the proposed converter topology, a PSpice simulation model and a 600 W converter prototype were developed. Both simulation and experimental results show successful operation of the converter. M. Ishida, Y. Uemoto, T. Ueda, T. Tanaka, D. Ueda, "GaN power switching devices," 2010 International Power Electronics Conference (IPEC), pp. 1014-1017, 21-24 June 2010. J. Millan, P. Godignon, X. Perpina, A. Perez-Tomas, J. Rebollo, "A Survey of Wide Bandgap Power Semiconductor Devices," IEEE Transactions on Power Electronics, vol. 29, no. 5, pp. 2155-2163, May 2014. T. Ueda, "Recent advances and future prospects on GaN-based power devices," 2014 International Power Electronics Conference (IPEC-Hiroshima 2014 - ECCE-ASIA), pp. 2075-2078, 18-21 May 2014. T. Morita, S. Tamura, Y. Anda, M. Ishida, Y. Uemoto, T. Ueda, T. Tanaka, D. Ueda, "99.3% Efficiency of three-phase inverter for motor drive using GaN-based Gate Injection Transistors," 2011 Twenty-Sixth Annual IEEE Applied Power Electronics Conference and Exposition (APEC) , pp. 481-484, 6-11 Mar. 2011. Weimin Zhang, Zhuxian Xu, Zheyu Zhang, F. Wang, L. M. Tolbert, B. J. Blalock, "Evaluation of 600 V cascode GaN HEMT in device characterization and all-GaN-based LLC resonant converter," 2013 IEEE Energy Conversion Congress and Exposition (ECCE), pp. 3571-3578, 15-19 Sep. 2013. A. Tuysuz, R. Bosshard, J. W. Kolar, "Performance comparison of a GaN GIT and a Si IGBT for high-speed drive applications," 2014 International Power Electronics Conference (IPEC-Hiroshima 2014 - ECCE-ASIA), pp.1904-1911, 18-21 May 2014. B. Hughes, J. Lazar, S. Hulsey, M. Musni, D. Zehnder, A. Garrido, R. Khanna, R. Chu, S. Khalil, K. Boutros, "Normally-off GaN-on-Si multi-chip module boost converter with 96% efficiency and low gate and drain overshoot," 2014 Twenty-Ninth Annual IEEE Applied Power Electronics Conference and Exposition (APEC), pp. 484-487, 16-20 Mar. 2014. K. Shirabe, M. M. Swamy, Jun-Koo Kang, M. Hisatsune, Wu Yifeng, D. Kebort, J. Honea, "Efficiency Comparison Between Si-IGBT-Based Drive and GaN-Based Drive," IEEE Transactions on Industry Applications, vol. 50, no. 1, pp. 566-572, Jan. -Feb. 2014. M. D. Seeman, S. R. Bahl, D. I. Anderson, G. A. Shah, "Advantages of GaN in a high-voltage resonant LLC converter," Twenty-Ninth Annual IEEE Applied Power Electronics Conference and Exposition (APEC), pp. 476-483, 16-20 Mar. 2014. M. Acanski, J. Popovic-Gerber, J. A. Ferreira, "Comparison of Si and GaN power devices used in PV module integrated converters," 2011 IEEE Energy Conversion Congress and Exposition (ECCE), pp. 1217-1223, 17-22 Sep. 2011. A. Hensel, C. Wilhelm, D. Kranzer, "Application of a new 600 V GaN transistor in power electronics for PV systems," 2012 15th International Power Electronics and Motion Control Conference (EPE/PEMC), pp. DS3d.4-1-DS3d.4-5, 4-6 Sep. 2012. L. Garcia-Rodriguez, V. Jones, J. C. Balda, E. Lindstrom, A. Oliva, J. Gonzalez-Llorente, "Design of a GaN-based microinverter for photovoltaic systems," 2014 IEEE 5th International Symposium on Power Electronics for Distributed Generation Systems (PEDG), pp.1-6, 24-27 June 2014. S. B. Kjaer, J. K. Pedersen, F. Blaabjerg, "A review of single-phase grid-connected inverters for photovoltaic modules," IEEE Transactions on Industry Applications, vol. 41, no. 5, pp. 1292-1306, Sep.-Oct. 2005. S. Jain, V. Agarwal, "A single-stage grid connected inverter topology for solar PV systems with maximum power point tracking," IEEE Transactions on Power Electronics, vol. 22, no. 5, pp. 1928-1940, Sep. 2007. 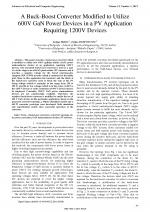 R. Gonzalez, J. Lopez, P. Sanchis, L. Marroyo, "Transformerless inverter for single-phase photovoltaic systems," IEEE Transactions on Power Electronics, vol. 22, no. 2, pp. 693-697, Mar. 2007. T. Kerekes, R. Teodorescu, U. Borup, "Transformerless Photovoltaic Inverters Connected to the Grid," Twenty Second Annual IEEE Applied Power Electronics Conference (APEC 2007), pp. 1733-1737, Feb. 25-Mar. 1, 2007. F. Schimpf, L. E. Norum, "Grid connected converters for photovoltaic, state of the art, ideas for improvement of transformerless inverters", Nordic Workshop on Power and Industrial Electronics (NORPIE/2008), June 9-11, 2008. T. Kerekes, M. Liserre, R. Teodorescu, C. Klumpner, M. Sumner, "Evaluation of three-phase transformerless photovoltaic inverter topologies," IEEE Transactions on Power Electronics, vol. 24, no. 9, pp. 2202-2211, Sep. 2009. S. V. Araujo, P. Zacharias, R. Mallwitz, "Highly efficient single-phase transformerless inverters for grid-connected photovoltaic systems," IEEE Transactions on Industrial Electronics, vol. 57, no. 9, pp. 3118-3128, Sep. 2010. Wensong Yu, Jih-Sheng Lai, Hao Qian, C. Hutchens, "High-efficiency MOSFET inverter with H6-type configuration for photovoltaic nonisolated AC-module applications," IEEE Transactions on Power Electronics, vol. 26, no. 4, pp. 1253-1260, Apr. 2011. T. Kerekes, R. Teodorescu, P. Rodriguez, G. Vazquez, E. Aldabas, "A new high-efficiency single-phase transformerless PV inverter topology," IEEE Transactions on Industrial Electronics, vol. 58, no. 1, pp. 184-191, Jan. 2011. Li Zhang, Kai Sun, Lanlan Feng, Hongfei Wu, Yan Xing, "A family of neutral point clamped full-bridge topologies for transformerless photovoltaic grid-tied inverters," IEEE Transactions on Power Electronics, vol. 28, no. 2, pp. 730-739, Feb. 2013. T. K. S. Freddy, N. A. Rahim, Wooi-Ping Hew, Hang Seng Che, "Comparison and analysis of single-phase transformerless grid-connected PV inverters," IEEE Transactions on Power Electronics, vol. 29, no. 10, pp. 5358-5369, Oct. 2014. D. Reusch, J. Strydom, "Understanding the effect of PCB layout on circuit performance in a high frequency gallium nitride based point of load converter," Twenty-Eighth Annual IEEE Applied Power Electronics Conference and Exposition (APEC), pp. 649-655, 17-21 Mar. 2013. 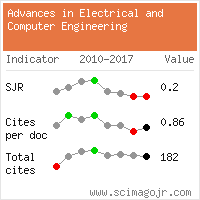 Citations for references updated on 2019-04-21 04:13 in 166 seconds. Website conception, design and maintenance by Eugen COCA. Content updated on 28 Feb 2019. Site engine updated on 28 Feb 2019. This page was generated on the server in 0.105 seconds and loaded in your browser in > seconds.